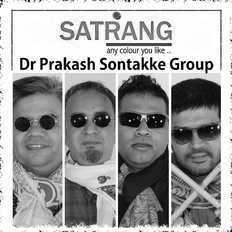 Dr Prakash Sontakke Group | OK Listen! DSPG was put together by Dr. Prakash Sontakke to harness the collective spontaneity of seasoned musicians to create original music that could then be performed and enhanced through live collaboration. The band's first album, Progressive Raga, attempts precisely this, with each of the seven tracks created collaboratively and tracked immediately. Additional layering was again done in a collaborative manner. The band welcomes musicians to bring in their ideas and inputs for any of the tracks to leave their signature on it. Our aim is to showcase how Indian Classical music can coexist and blend with any other musical genres, playing varied roles and at different levels, not necessarily the topmost every time. The band's music also aims to present musical complexities like unusual time signatures in groovy, ear friendly formats.